Sonata is the lowest priced of Fleetwood’s three ranges. 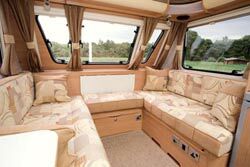 It’s a modestly priced family caravan without the interior opulence of the top of the range Fleetwood Heritages. Even so, the Sonata’s revamped body shell has curves which Heritage barely dreams of. Sonata is one of the most distinctive caravan ranges you’ll see on a UK site, and there’s a stylish simplicity before you even go inside. Darker windows this year add Ray-Ban appeal. Inside, the Fleetwood has no separate end lounge, and you get a side dinette instead, giving you a family eating area which you can use when the front dinette’s made up. The interior feels light and modern, with simple upholstery that will take a while to date. It’s very much a family caravan with a triple bunk. These tuck neatly behind the washroom at the back of the caravan. Each bunk gets its own reading light and window and the bottom bunk has one great advantage over competitors in that it has an outside door, making this ideal luggage space in transit and great for storage if you have fewer than three kids. The kitchen is pretty well equipped for the price, with a Spinflo Caprice Mk III oven and grill, a 97-litre, curved door Thetford fridge and a three burner hob. The overhead lockers have locking latches, just over the kitchen area, to stop your crockery falling out en route. One of them has a plate rack and space for a car stereo. 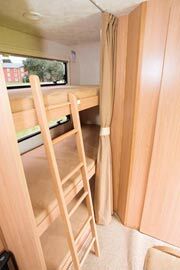 A large wardrobe between the kitchen and the triple bunks houses a Truma blown air heater. The caravan provides three sockets: two at dinette floor level and one at the side table next to the dinette, where you’d probably want to sit the TV. Equipment levels throughout the Sonata are good and include feature strip lighting, a spare wheel and an AL-KO AKS stabiliser. Corner steadies are heavy duty. We love the exterior luggage door at the back and the exterior styling. The Sonata makes a great family van. 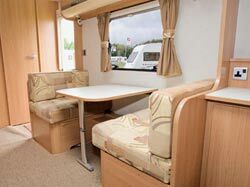 *Caravan insurance cost based on 2008 Fleetwood Sonata Concerto, fitted with hitchlock, wheelclamp and alarm. Kept on drive behind locked gates at HX2 7RZ. 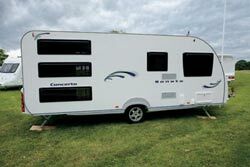 Caravanners over 30 years old, claim free for 3 years with no convictions and a member of a caravanning club. Sum insured = £13,495 plus £1000 for equipment. Premium includes insurance premium tax at 5% and is correct as of 11.09.08.